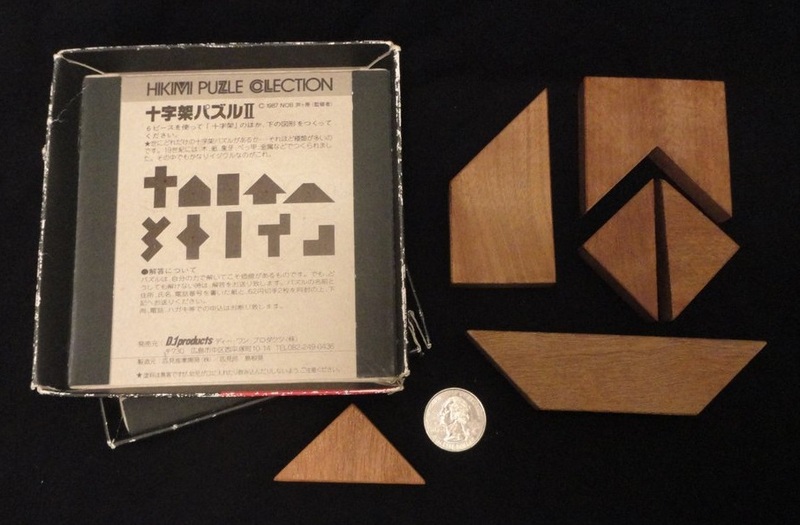 The iconic pattern/silhouette puzzle is Tangrams (Tan-Grams). 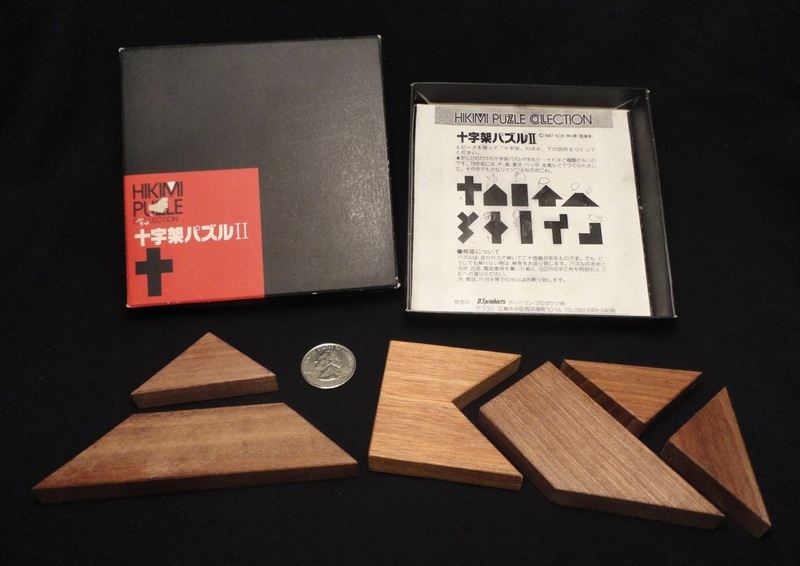 The Tangram is a special type of dissection puzzle. It is hugely popular and there is a wealth of information available about it on the Web. It consists of a square divided into seven pieces. The first problem is to construct the square from the pieces. 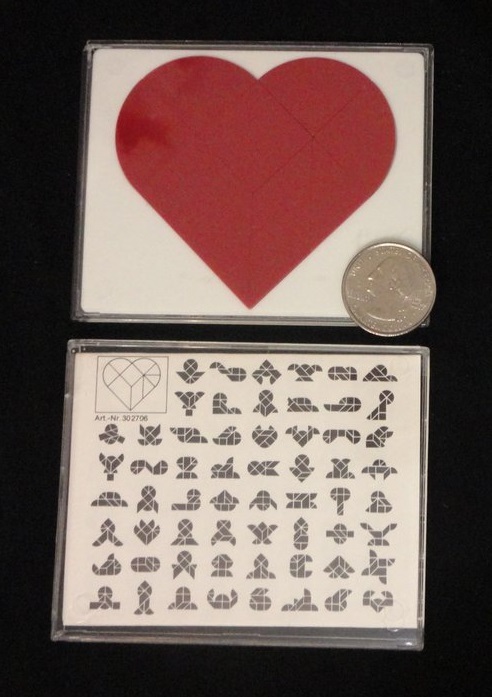 The difference between this type of puzzle and simple dissections, however, is that Tangram puzzles are accompanied by booklets or cards depicting various forms, often of geometric or stylized organic figures, that are to be modeled in two dimensions with the available pieces. The problem figures are shown in silhouette without revealing the internal borders of the individual pieces. The designs can be quite elegant and some can be challenging to properly model. If the puzzle doesn't come with problem silhouettes, it's a mere dissection. 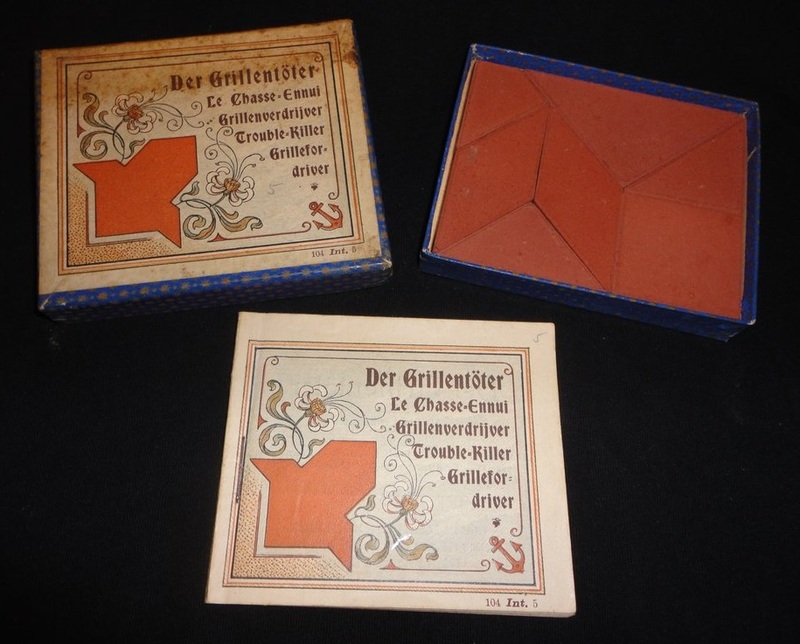 Jurgen Koeller's site has a nice section devoted to Tangrams, and shows some popular variants. Also check out the Tangraphy page at Ito Puzzle Land. Many sets have been produced, some dating back more than a century. Tangoes is a modern version. 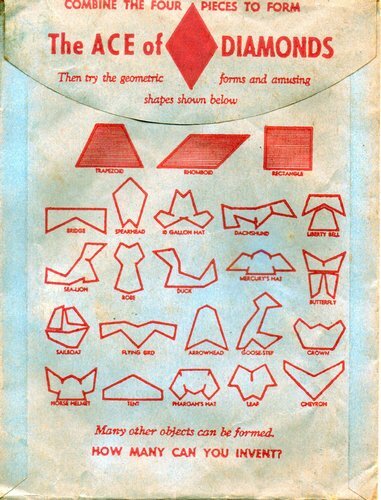 Tangrams probably originated in China in the late 1700's or early 1800's, not thousands of years ago as some have claimed. However, possibly the oldest known dissection puzzle, the "Loculus of Archimedes" or "Ostomachion" was written about in the 3rd century B.C. 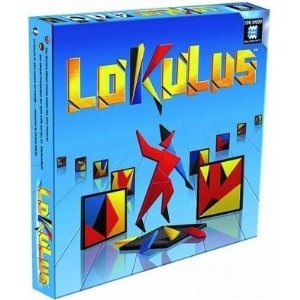 Read more about the Ostomachion below in my notes on the Lokulus puzzle. 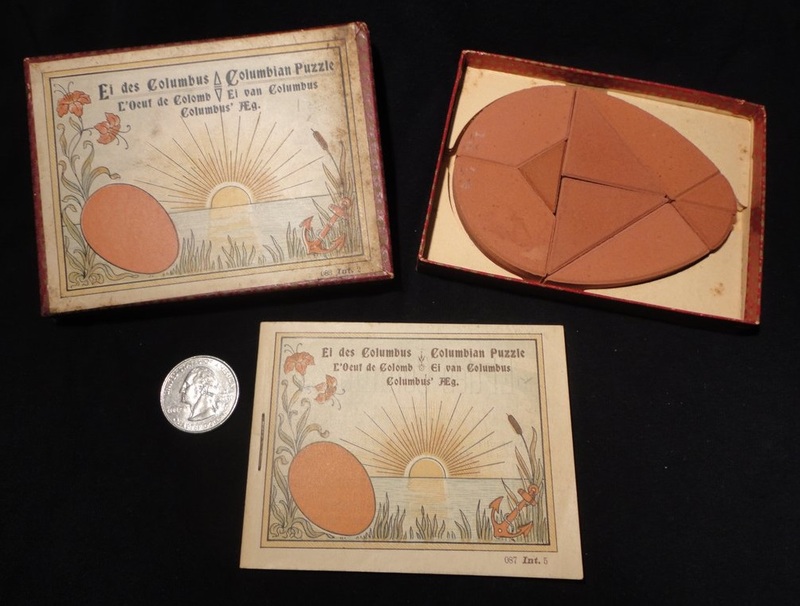 Tangrams was the first real puzzle craze to sweep Europe and America, from about 1815 onwards to 1822 or so. Ivory sets from China are particularly valuable. In Chinese, Tangrams are known as "Chi-Chiao" - "The Seven Clever Pieces." 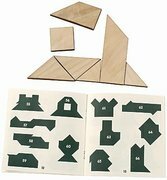 One interesting challenge using the standard Tangram set of seven pieces is to build all possible convex geometric figures. (A convex figure is one in which any two points can be connected by a straight line segment which lies entirely within the figure.) In 1942, the Chinese mathematicians Fu Traing Wang and Chuan-Chih Hsiung proved that there are only thirteen convex figures that can be constructed using the standard Tangram set. Another interesting challenge involves paradoxical Tangrams. Two silhouettes appear to be the same except for one piece, yet each is built using all seven pieces. You can see several at the Archimedes' Laboratory site. Any geometric shape can be dissected into pieces, and the pieces re-arranged to form fanciful figures. You can make up your own problems by inventing a pretty figure, tracing around the completed figure and then challenging others to reproduce it. 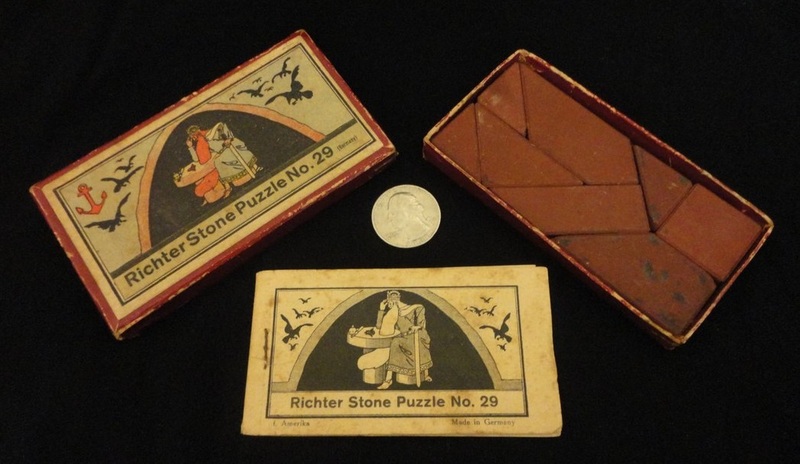 Perhaps no other company has expanded on the idea more than the German F. Adolph Richter and Company, which began producing a line of "Anchor Stone Puzzles" in 1882. 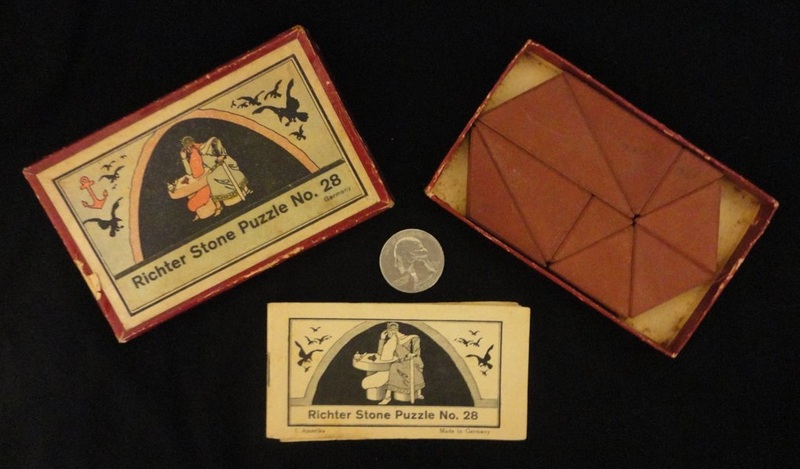 (They also made sets of building blocks, discussed on George Hardy's site.) 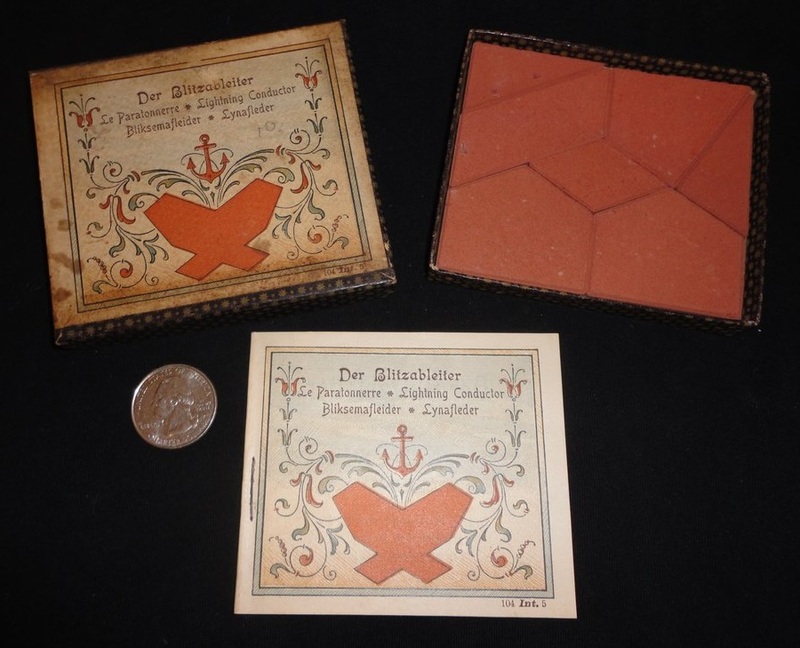 Richter made blocks from a mixture of Kaolin clay, sand, and linseed oil, based on a formula patented by Otto Lilienthal. Most of the Anchor puzzles are dissected rectangles. A team of artists came up with the hundreds of problem silhouettes. 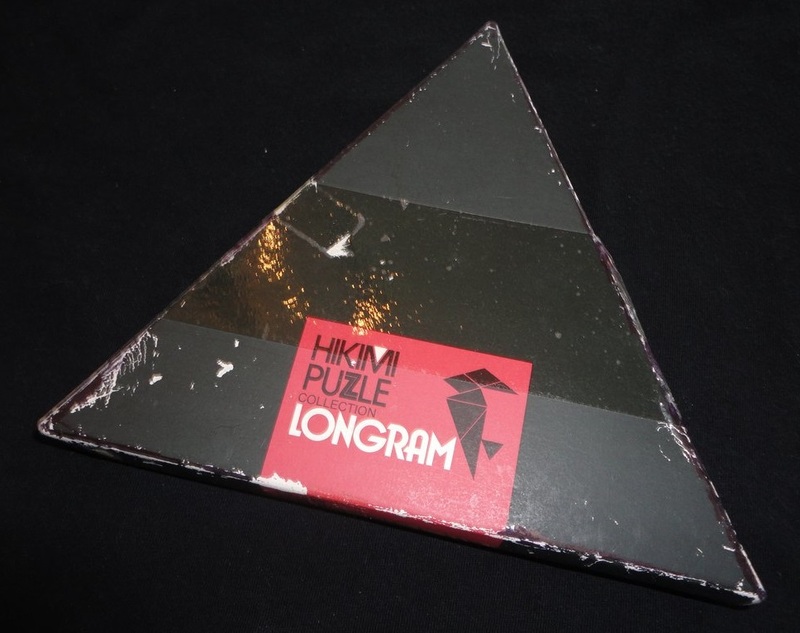 Jerry Slocum has written a book all about the familiar Tangram puzzle and its surprising history, and more recently issued a book all about the Anchor puzzles. The noted American puzzle inventor Sam Loyd published a book of over 650 problems called "The Eigth Book of Tan Part I" in 1903, and concocted a bogus backstory for the puzzle. 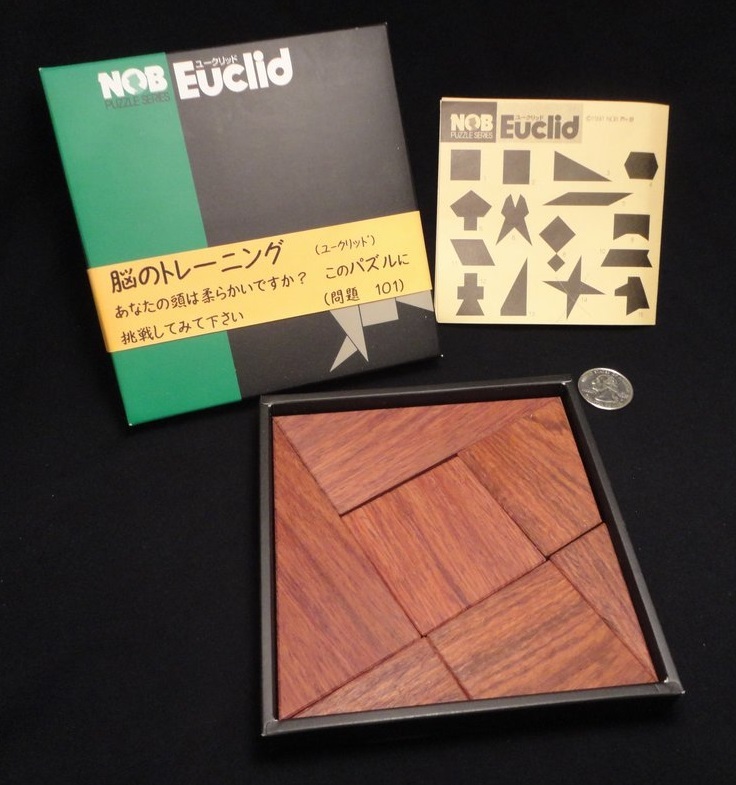 Slocum debunks Loyd's claims and explores the true history of the Tangram puzzle, based on globe-spanning research. 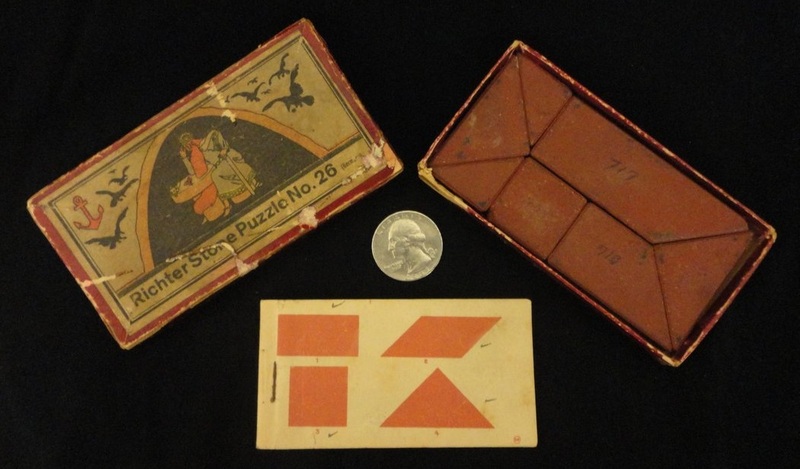 Slocum includes over 1700 Tangram problems compiled from several sources around the world and from different periods. By the late 1800's there were at least 36 puzzles in the Anchor lineup. Slocum and Botermans discuss the complete lineup in "Puzzles Old and New" on pp.27-33. Stewart Coffin examines them in his book The Puzzling World of Polyhedral Dissections. I list them in the table below, and show pictures I have been able to find. The Anchor puzzles are very collectible, if you're interested in this category. I own only those puzzles listed in bold. Some of the designs have proven to be broadly popular - I highlight those using a light background color. I have a metal version from Thinkfun called the Scrambled Egg. I have a modern plastic version, Kohner's Tormentor. 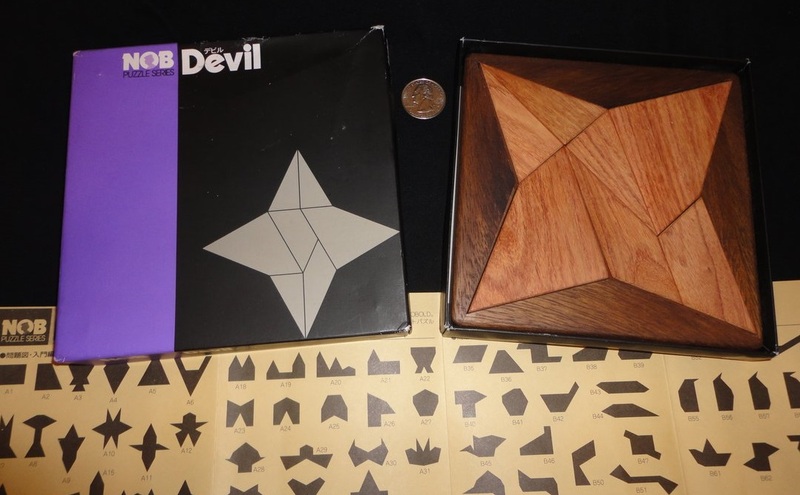 Note: the Devil puzzle in wood offered by B&P is identical. 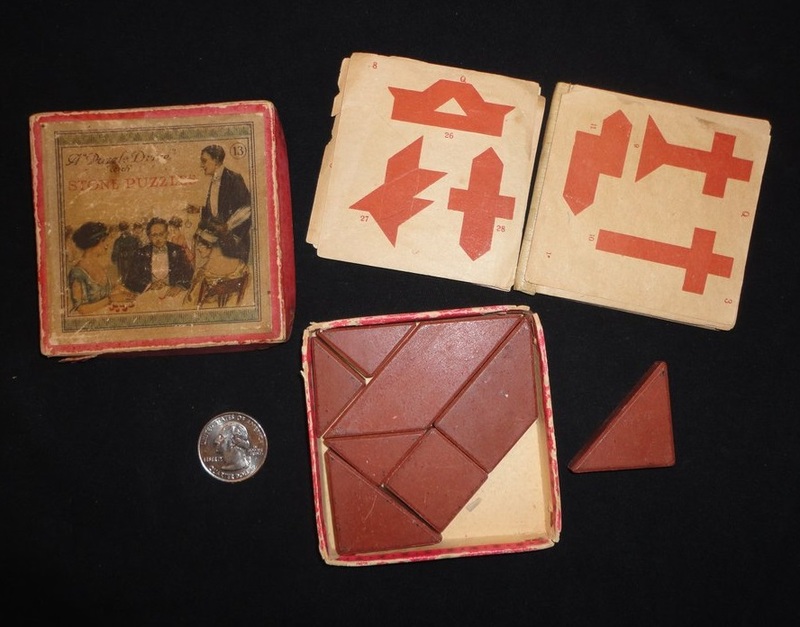 This is the "classic" Tangram set. I have an Anchor version in an old blue box, and a copy offered a while ago by Bits and Pieces. I also have a modern plastic version, Kohner's Pythagoras (not to be confused with Anchor's #12). I also have a copy offered a while ago by Bits and Pieces. The Lucky Puzzle from Japan is a plastic version. Kohner's Voodoo is another plastic version. Zany, copyright 1939 by the Martel Co. of N.Y. is a copy. The set includes seven green wooden pieces from which one can construct a square approx. 70mm on a side. A "Puzzle Book No. 1" contains 138 problems, and solutions are shown in the corresponding "Answer Book No. 1." 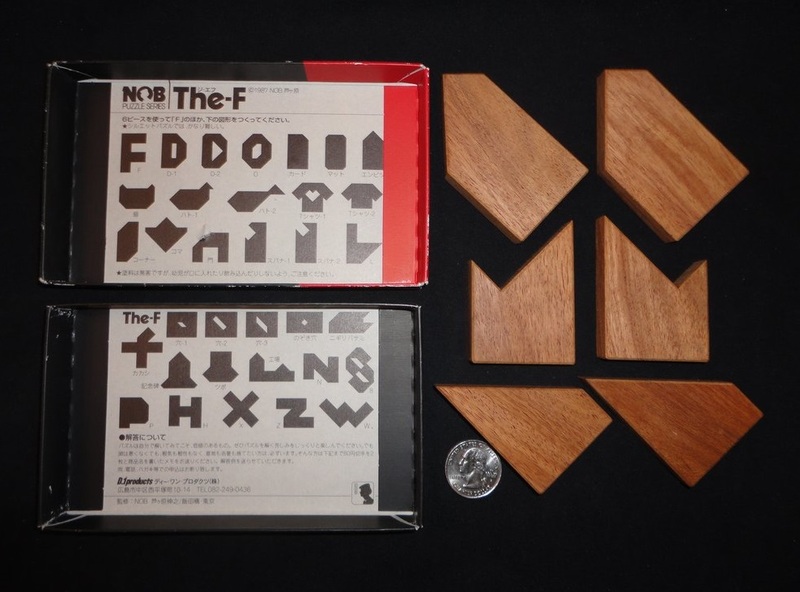 A Puzzle Drive (Anchor) Tangram style Puzzle No. 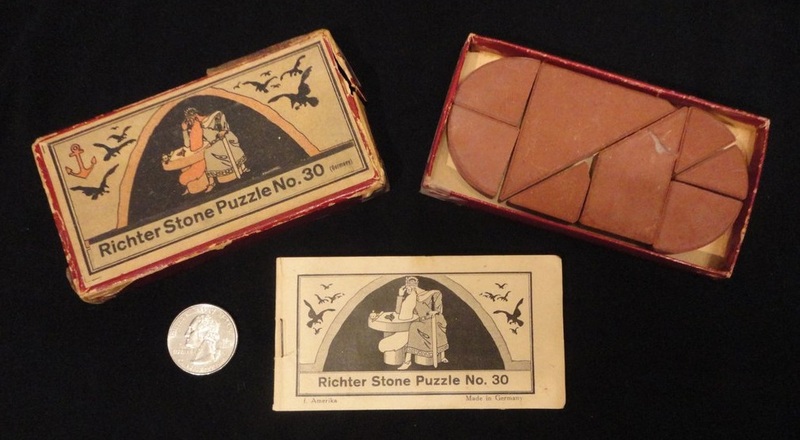 13 "Qualgeist"
Lott's Stone Puzzle is a copy. I have a recent copy of Nur Mut. The "Loculus (Box) of Archimedes" or Ostomachion, meaning "bone fight," or Syntemachion (sometimes referred to incorrectly as the "Stomachion" - see this great article at archimedes-lab.org) is indelibly associated with the ancient Greek scientist Archimedes of Syracuse, who lived c. 287-212 B.C. and is considered to be the greatest mathematician of antiquity. 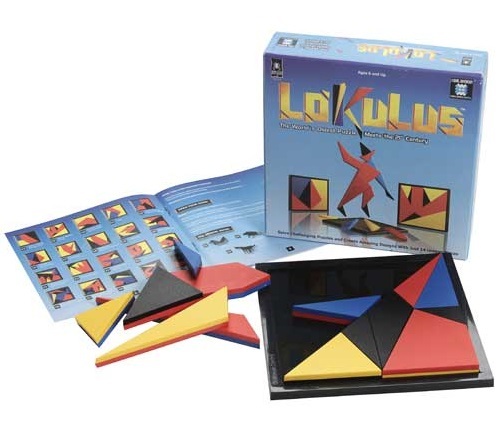 It is a 2200 year old 14-piece dissection of a square - a Tangram-style puzzle or game that is thought to have been played by several players using pieces made of bone or ivory. Various goals include re-forming the square, and forming various figures in the usual Tangram manner. One question was "How many ways can the pieces be arranged to form a square?" Other ancient authors, all later than Archimedes, mention the game as well, and it is not known whether the game itself or Archimedes' investigation of it is older. The Dr. Wood version is made of colorful plastic and includes a tray and a booklet of 73 challenges. The color assignments (red, yellow, blue, black) to both sides of each piece allow for some interesting challenges. A description of the Ostomachion was found in the Archimedes Palimpsest, a parchment codex dating from tenth-century Byzantium. The palimpsest contents were released publicly in digital form and can also be downloaded at archive.org. As reported in a NY Times article by Gina Kolata, published Dec. 14 2003, according to Dr. Reviel Netz, a classics professor at Stanford, until the information in the palimpsest came to light, though it was known that Archimedes had investigated the Ostomachion, it was unlcear as to its significance. The palimpsest reveals that Archimedes was investigating the number of ways the pieces can form a square - an early foray into the science of combinatorics. A PDF of Netz' 2004 paper (with Fabio Acerbi and Nigel Wilson) Towards a Reconstruction of Archimedes' Stomachion can be found at matetam.com. Archimedes demonstrated that the area of each piece is rationally commensurate with the square (in the ratio 1:48). The square is an integer multiple of the area of each triangular piece - the overall square is 144 units and the pieces are either 3,6,9,12, or 24 units in area (the pentagonal "house" shaped piece is 21 units). (I have read that the palimpsest refers to a version stretched to twice the width of the square version shown here, which is a bit confusing if the investigation is into a square, not a rectangle.) Archimedes himself might not have known the number of solutions - he refers only to "multitudes." 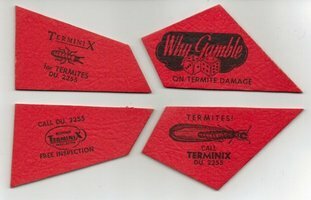 Joe Marasco gives a good chronology and account of the re-popularization of the puzzle at his website, barbecuejoe.com. Marasco says that he commissioned the work to determine the number of solutions, and that Bill Cutler answered the challenge, computing that excluding rotations, reflections, and permutations of identical pieces, there are 536 distinct solutions. Without exclusions, there are 17,152 solutions, independently confirmed by graph theorists Fan Chun and Ron Graham (the Kolata article incorrectly attributes the solution to Chun and Graham with confirmation by Cutler, but it is the other way around). Marasco also provides a diagram of the 536 solutions. Kadon also has a great article on the Ostomachion. There is some information at George Miller's website. See also an article by Ed Pegg Jr. According to 4umi.com, "The remaining Greek fragments of Stomachion appear on the very last folio in the Archimedes Palimpsest. The evidence suggests the palimpsest originally contained more pages, but several are missing at the end. Following the prayer book page numbering, the essay begins on folio 177 recto - 172 verso and continues on the reverse side 177 verso - 172 recto. It is preceded by The Method of Mechanical Theorems. The text, which remains quite fragmentary, sets out to compare the various angles of the puzzle pieces. A diagram of a Stomachion square is visible in the righthand column on 177 verso." The same website tells us that "Roman poet Decimus Magnus Ausonius (ca. 310 � ca. 393) mentions the Stomachion in his description of a type of poetry in which various meters are put together, like the pieces of the puzzle, in the introduction to his book Cento Nuptialis (A Wedding Cento)." Ausonius writes "... [the Cento] is like the puzzle which the Greeks have called ostomachia. There you have little pieces of bone, fourteen in number and representing geometrical figures. For some are equilateral triangles, some with sides of various lengths, some symmetrical, some with right angles, some with oblique: the same people call them isosceles or equal-sided triangles, and also right-angled and scalene. By fitting these pieces together in various ways, pictures of countless objects are produced: a monstrous elephant, a brutal boar, a goose in flight, and a gladiator in armour, a huntsman crouching down, and a dog barking � even a tower and a tankard and numberless other things of this sort, whose variety depends upon the skill of the player. But while the harmonious arrangement of the skilful is marvellous, the jumble made by the unskilled is grotesque." Here are two versions of the Elzzup puzzle by Wm. F. Drueke. Mental Aerobics - by Maple Landmark. A tangram set, equivalent to the Anchor #26 "Bose Sieben." Purchased during a visit to the Vermont Country Store. 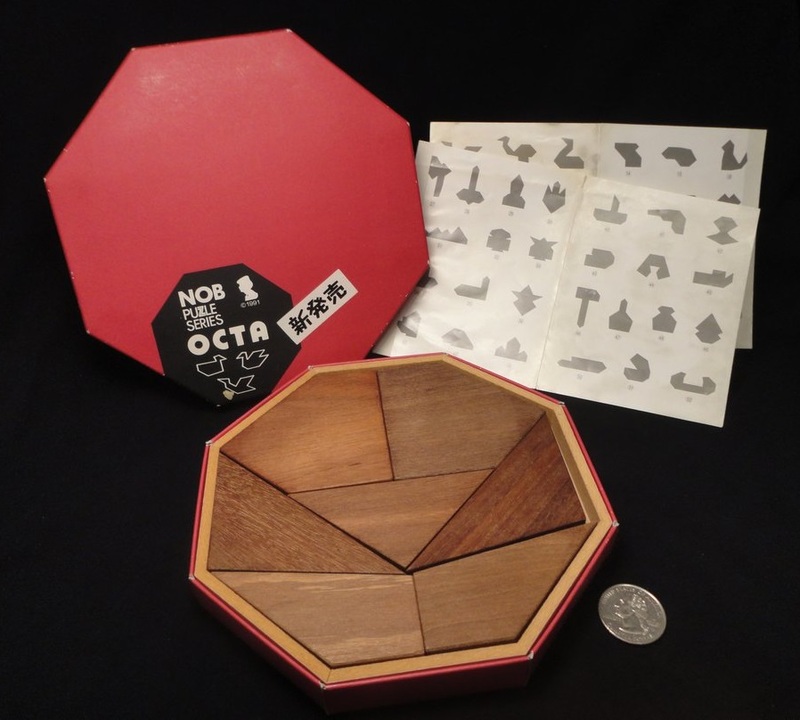 This is the Tangrams Box by James Lyon. 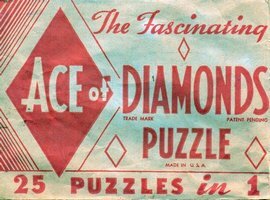 This is a vintage Ace of Diamonds puzzle. It is a four-piece dissection of a diamond shape. 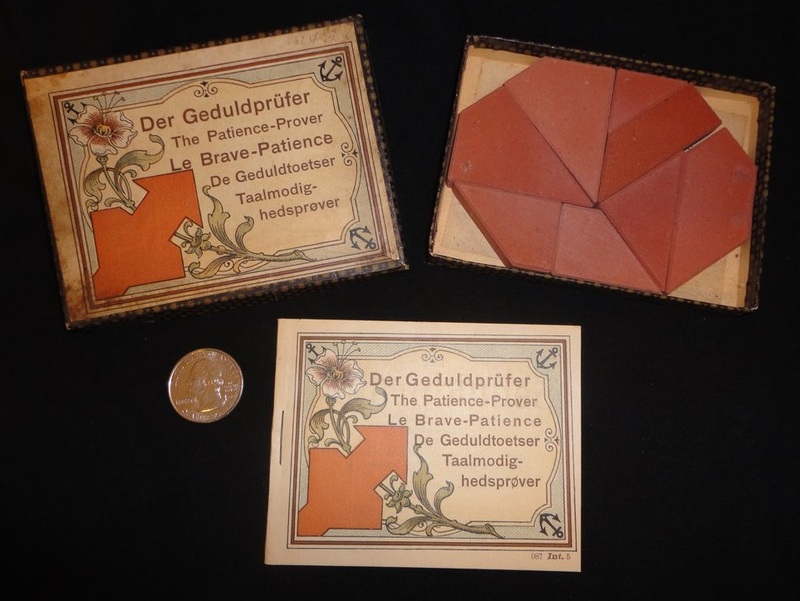 The four pieces can also be used to make several other shapes as shown on the back of the envelope, including a rectangle (but not a square) and the interesting "Goose-Step," so this puzzle is a tangram-type as well. 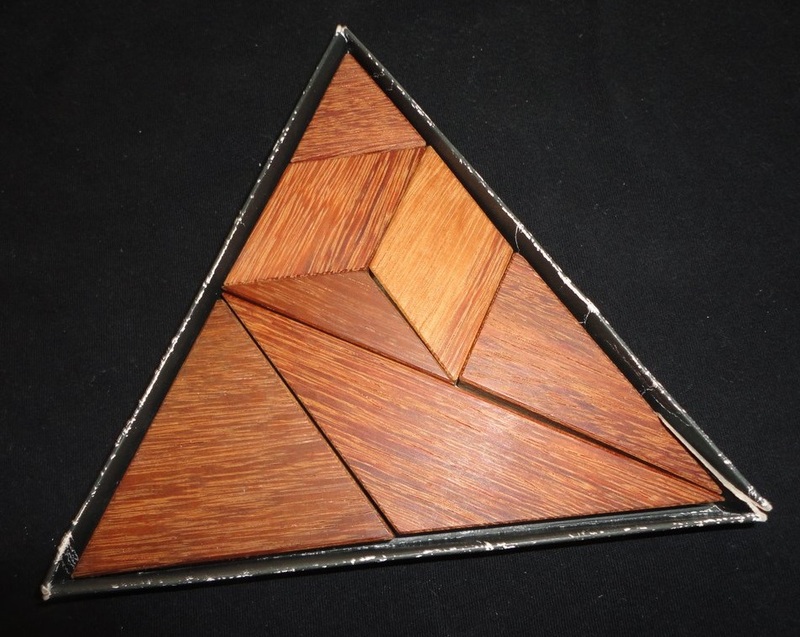 A nice wooden tangram-style puzzle. 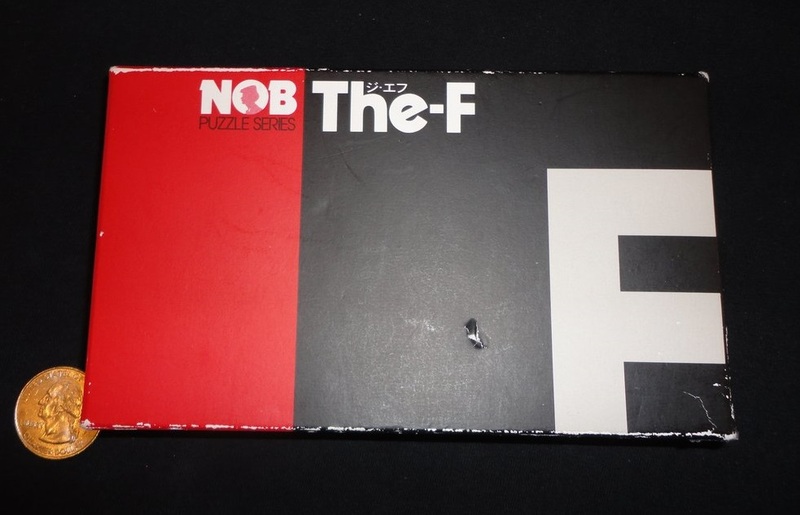 The first challenge, to reassemble the dissected letter F, is quite enjoyable.